Former South Bend Cubs outfielder Ian Happ and ex-Beloit Snappers RHP Dylan Covey led the Mesa Solar Sox to a 6-1 win over the Surprise Saguaros in the Arizona Fall League Championship Game on Saturday. Happ went 4-for-4 with two home runs, a double, three runs batted in, and three runs scored. The switch-hitter homered from both sides of the plate, something he told reporters he had never done before in his life. Happ played 38 games with South Bend in 2015, batting .241 with 5 HR and 22 RBI. He split the 2016 season between High-A and Double-A, cumulatively batting .279 with 15 HR and 73 RBI in 134 games. Covey started the championship game for Mesa and got the win after giving up only one run on one hit and one walk while striking out three batters in five innings. Earlier this month he pitched the first five innings of a no-hitter for Mesa against Surprise. It was only the third no-hitter in the 25-year history of the Arizona Fall League. 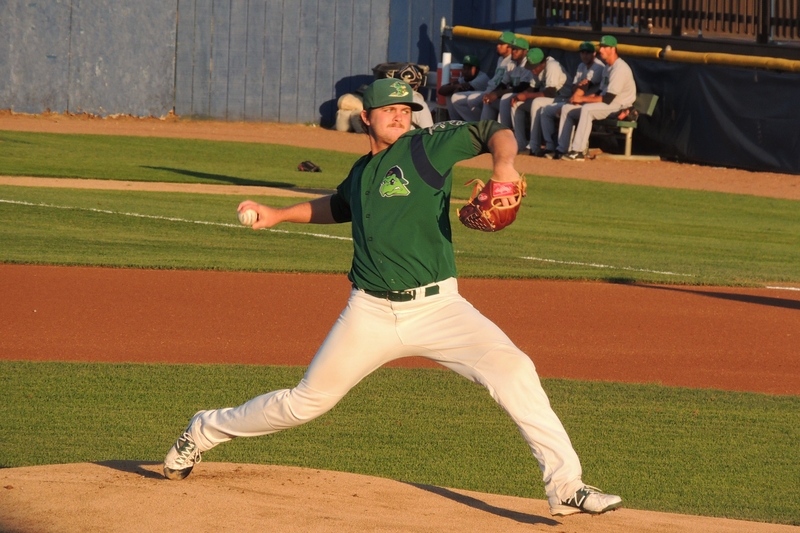 Covey pitched for the Snappers in 2013 and 2014, cumulatively going 5-10 with a 4.79 ERA, 101 strikeouts and 43 walks in 148.1 innings (28 games/27 starts). The Oakland Athletics prospect started 2016 with the Double-A Midland RockHounds, going 2-1 with a 1.84 ERA, 26 strikeouts and 17 walks in 29.1 innings (six starts) before a torn oblique muscle ended his regular season in early May. The Solar Sox were managed by former Snappers skipper Ryan Christenson. He is slated to manage Oakland’s Triple-A team, the Nashville Sounds, in 2017. New York Yankees prospect Gleyber Torres was named the Arizona Fall League’s Most Valuable Player after leading the AFL in batting average (.403) and on-base percentage (.513), and finishing second in slugging percentage (.645). The former South Bend Cubs shortstop is the youngest MVP winner in AFL history; he turns 20 on December 13. Torres was named the Midwest League Prospect of the Year in 2015, when he batted .293 with three homers, 24 doubles, 62 RBI and 22 stolen bases in 119 games with South Bend. He played in High-A for the Cubs and the Yankees during the 2016 season, leaving Chicago for New York in late July as a key piece in the Aroldis Chapman trade. He batted .270 with 11 HR, 66 RBI and 21 SB in 125 games. This entry was posted in 2016 AFL Championship Game, Arizona Fall League, Beloit Snappers, Midland RockHounds, Midwest League, Nashville Sounds, Pacific Coast League, South Bend Silver Hawks, Texas League. Bookmark the permalink.